Adventure, nature, yoga, relaxation and comfort â€¦ you have it all at Playa Nicuesa Rainforest Lodge in Costa Rica. And now in Green Season, you can have it all for a better price! The unique rainforest lodge in Costa Rica is offering a special vacation deal of a free extra night when you stay three nights. The offer is valid now through Sept. 30, 2014, and applies to any room category. A true Costa Rica eco-lodge, Playa Nicuesa Rainforest Lodge embraces conservation and harmony with nature, and at the same time offers comfortable luxury in the jungle. You can choose to stay in either a private cabin or in the two-story Mango Guest House, which has four rooms each with private bathrooms and a balcony or terrace. Three healthy, delicious meals per day are included with your stay, along with unlimited use of the lodgeâ€™s trails, kayaks, snorkeling and fishing equipment, and boat pick-up and drop-off from/to Puerto Jimenez or Golfito. 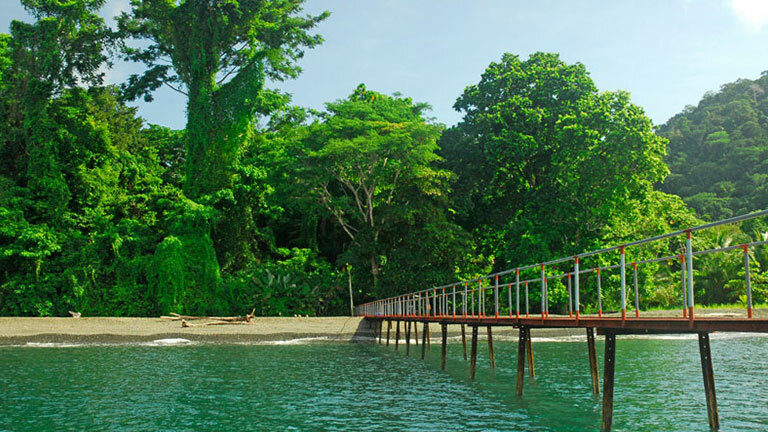 Accessible only by boat, Playa Nicuesa is beachfront on the breathtaking Golfo Dulce (â€œSweet Gulfâ€), one of only a handful of unique tropical fjords in the world. The renowned Osa Peninsula is just across these placid Pacific Ocean waters from the lodge, which is surrounded by its own private nature reserve that joins into the Piedras Blancas National Park. Another excellent offer is the Yoga Bliss Vacation Package: stay five, six or seven nights at Playa Nicuesa Rainforest Lodge in your choice of accommodations, and receive two yoga classes daily and three guided adventure activities, in addition to Playa Nicuesaâ€™s usual vacation amenities. At Playa Nicuesa, you can enjoy multiple adventure tours and activities: rainforest hikes, bird-watching, kayaking, snorkeling, botanical gardens, fishing, horseback riding, dolphin and whale watching, on-site yoga classes and massages, and hammock relaxing.